Rarely does bass sit in the backseat while vocals take the lead on a single. It's usually the exact opposite. Bass is the star, and vocals are the supporting actor. The rapid ascent of Bonnie X Clyde (BXC) proves, though, that there's a niche for their "vocal bass" music where bass plays second fiddle. Bonnie X Clyde, the duo comprised of DJ Daniel Litman and vocalist Paige Lopynski, explained in a recent interview with Views from the Pit that their rise above an always crowded landscape can be credited to bucking the established way of doing things. "In an industry where everyone is making music, you need to find that certain quality that makes you unique, something that sets you apart from everyone," Paige "Bonnie" Lopynski stated. The Miami-based team's distinctive sound, which can be heard on their 2015 release "Rise Above," contributed to the pair quickly becoming a mainstay of the festival and club circuit. 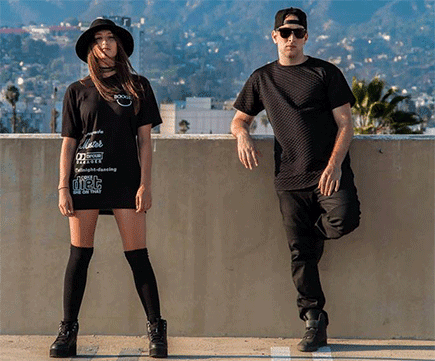 Bonnie X Clyde entertained audiences with performances at EDC Orlando, Okeechobee Music Festival, Nocturnal Wonderland, LIC Fresno as well as three sets at this year's Electric Daisy Carnival in Las Vegas. Following an impressive February show at Bass Continuum, BXC has another trip to Atlanta planned for next month at Opera Nightclub. A six-track EP, "Wanted" is now available for download on iTunes and features the popular single, "Bass Jam." "Bass Jam" currently rides high on the Sirius XM BPM Beats of the Week chart, claiming the top spot for four weeks.